Just can't bring yourself to vote for any of the candidates this year? Here's a campaign you might be able to support. Don't want to vote for any of the presidential candidates this year? Wish we could just nuke the entire campaign season and start anew? Here's the political bumper sticker for you. Designed with the same color scheme as a Bernie Sanders sign, this bumper sticker appeared on Reddit Sunday and immediately developed a fan following that would likely get it on the ballot in all 50 states. The first Reddit post showed a simple photo of the sticker on a car bumper, with the headline "Finally figured out who I'm voting for this election," but the slogan soon took on a life of its own. Fans soon began helping Giant Meteor develop a campaign strategy and platform. Pretty good for an inanimate and potentially deadly space rock. 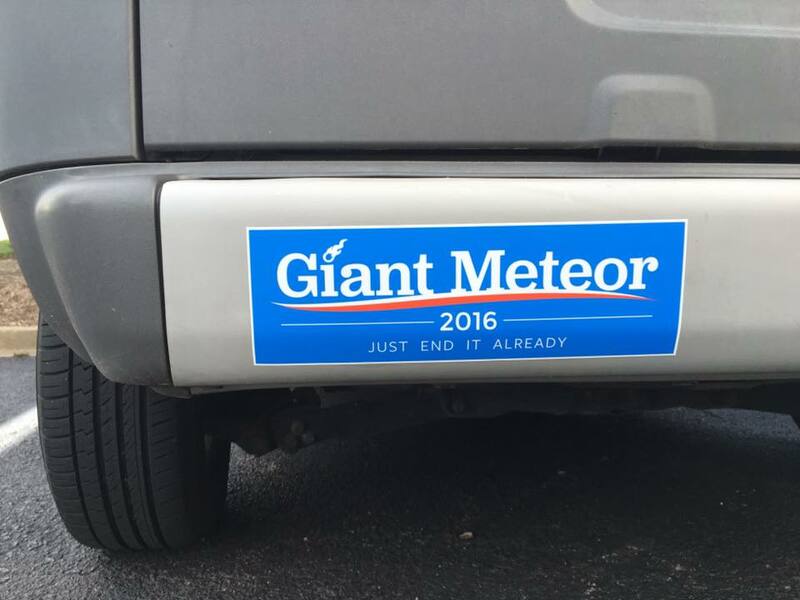 "Giant Meteor will end nearly all of our nation's chronic problems," wrote one Reddit user. "The national debt? Gone. Environmental pollution? Sayonara. Unaffordable healthcare? Obliterated." Donald Trump: The president to take us to Mars? Chimed in another, "Giant Meteor is bringing beach front property to the Midwest!" Still another pointed to history: "Look how successfully the previous Giant Meteor administration solved the pesky dinosaur problem." And a few played with Donald Trump's slogan of "Make America Great Again," proclaiming Giant Meteor's campaign slogan to be "MAKE AMERICA A CRATER AGAIN." But at the last minute, a dark-horse candidate appeared. "While Giant Meteor does meet the minimum age requirement of 35 years by a fair margin, unfortunately Giant Meteor wasn't born in the United States," wrote Reddit user sharklops. "This is why I support Yellowstone Supervolcano in this election." Giant Meteor was last seen streaking across the sky in preparation for the election and could not be reached for comment.